If you set on fire all the cards I've made lately that I hated, you could power Chicago for a week. So I decided to go super simple with this one and I love the result. 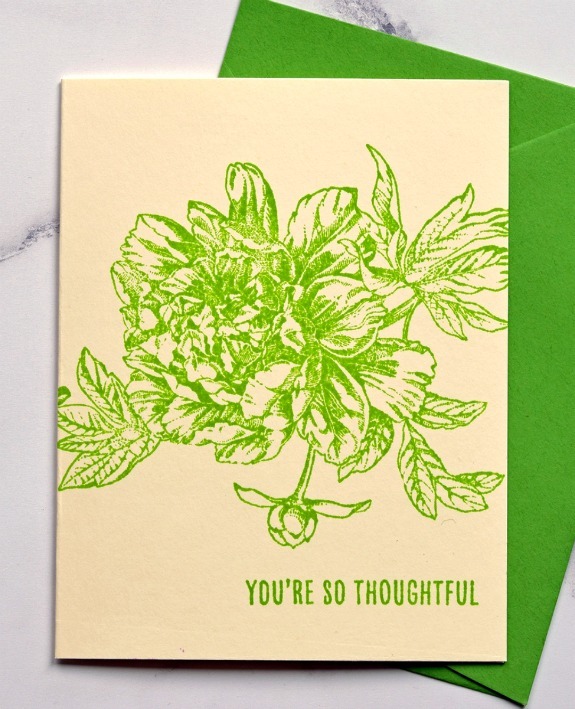 This gorgeous flower is from the Kindness Noted set by The Stamp Market. It's a large image and the set is huge. Love all of it. Stamped the flower on cream cardstock with Altenew Parrot ink. The sentiment is from Reverse Confetti's Whole Lotta Thanks. Ink, stamps, and paper. Can't get much simpler! MOOD WHEN DONE = I am overwhelmed by the amount of caring and support I'm getting from my readers. Thanks so much. Oh and I like the card a lot! Beautiful, Joan! You're in my thoughts -- sending hugs! This is awesome, what's not to love about all that glorious green?! You always draw me in, even on lazy days. Oh, and thanks for giving me an overwhelming urge to use cream cardstock again. Now Im going to look like a cheater. That's one big, beautiful stamp! No coloring necessary with all that detail. I love the green, and it's such a perfect match with the envelope. What a beautiful stamp and card that you made from it. I love it when a single image can be 'the card'. Outstanding! It is a concept I loose sight of often, and then smack the forehead when it comes back to me after sacrificing many pieces of card stock. Super simple is simply great!